Has the classic PRS electric changed? Subtly upgraded over the standard Custom 24, a super, classic-sounding take on PRS's solidbody electric classic. Effortless playability. Superb intonation and tuning stability. Hugely versatile sounds for a really wide range of styles. A quality working tool. As always, it doesn't come cheap. This year's Anniversary puts the original Custom centre-stage, with four 30th Anniversary models in PRS's SE, S2, Private Stock and, as here, the core USA line. Although the quartet spans a very wide price range, all use the 30th Anniversary bird inlays, slightly offset as they fly up the 'board, with a double bird at the 12th fret. Our core Custom 24 keeps Anniversary bling to a minimum - just an Anniversary logo on the truss rod cover and a thick, inlaid line inside the fingerboard and rosewood veneer-faced headstock edges. Hardware is 'hybrid'- a mix of gold- and nickel-plated parts. Originally, the Custom was all about combining humbucking and single-coil tones in one instrument, and it's the way that is achieved, along with the specific recipe of the dual humbuckers, that has evolved constantly over the years. "Everything is perfectly executed high quality - words that have been associated with PRS from day one"
And while this 30th version retains the master volume and tone control, along with the five-way lever pickup selector switch that became standard on the Custom in 2011, it's the pickups here that are brand new. The latest in the 'date' series, they continue Paul Reed Smith's ongoing quest to nail the 'best' PAF-style 'bucker. Available covered on this year's SC 245 and new P245, and called 58/15s, the uncovered versions here, which show off their proprietary square-edged bobbins, are called 85/15s. Covers aside, the internals are identical. Typically tight-lipped about what's under the hood, Smith prefers to discuss the sonic differences. "They are a step clearer [than the 57/08]," he begins. "If you listen to a set of old PAFs, they almost sound like Strat pickups - they are very clear-sounding pickups. As a matter of fact, sometimes some PAFs with their covers removed can be brighter than Strat pickups - really bright but still in a musical way. "See, some people just don't remember how bright they [original PAFs] could be. There's a real trick to making them bright and musical and not bright and ice- pick-y. We have a machine that we test our pickups on - it has really helped us to 'see' the sound: it tells us exactly how the pickup will sound before we plug it in. It's wonderful." Plugging pickups into his testing rig, Smith shows us the tonal effect of covered versus uncovered humbuckers - the latter, as here, have noticeably more output and a slightly higher resonant frequency, which results in a subtly brighter tonality compared to the covered version. Of course, the pickup can hear only what the instrument is producing, and PRS's blend was certainly unique back in 1985. The offset double-cut body with its halfway-between-Gibson-and-Fender scale length, its vibrato with notched pivot screws and originally all-brass casting, now, as it has been for a considerable time, a two-piece design. While the vibrato has remained very true to the original vision, the locking tuners have evolved and today we're onto the third generation of top-locking types with open backs and a total absence of any nylon washers. The nut material has evolved, too; always friction-reducing, the latest recipe adds bronze and glass powder to the material. What has barely changed in 30 years is the construction style. The 49mm-thick Custom's body uses a one-piece 28.5mm mahogany back topped with a 20.5mm-thick, book-matched and centre-jointed carved maple cap. The extended tongue of the 24-fret, one-piece mahogany neck sits under the neck pickup, while the compact heel and the hallmark cutaway 'scoop' allow easy access to the top frets. Everything is perfectly executed high quality - words that have been associated with PRS from day one. It's super-sharp today, too: comparing fit and finish to a 1988 PRS Classic Electric, you can see and feel the differences as though every fine detail has been subsequently honed to perfection. This year's Custom is offered with two neck profiles: pattern thin or pattern regular, as here. Dimensionally, it measures 42.33mm at the nut, 52.02mm at the 12th fret; 21mm deep at the first fret and 23.2mm at the 12th. It's extremely mainstream in shape, a sloping shouldered 'C' that doesn't feel big or small, just right, in the hand. The Custom's hybrid halfway-between-Gibson-and-Fender reputation has not always connected with the player wanting to really nail those sounds of yesteryear. Earlier Customs have a pronounced midrange focus, invariably a hotter output too. Listening to a '94 Custom 22, even with its retrofitted, less mid-focused Dragon II humbuckers, the modern Custom sounds very different, and for players chasing more classic tonalities it's for the better. "The most classic voicing of the Custom yet? We think so. Certainly, the 30th performs in all manner of musical styles"
The neck pickup doesn't have the low-end depth of, say, a PRS Singlecut or a Les Paul, but it's extremely balanced - articulate without being sharp. Through a clean amp, it's an easy jazz fix or soulful blues lead voice; the bridge has clarity and bite, but without that midrange 'cloud' of many earlier PRS pickups. Adding a little hair to the amp, it's ringing, chiming classic roots rock we hear - not perhaps what everyone would expect. The dual-humbucker mix is equally classic, and with some volume reduction cleans up for thick, more single coil-like chunky rhythm fills. The two 'single coil' selections sound thinner; position two, the bridge humbucker and the slug inside-coil of the neck humbucker, is a little darker and more direct compared to the slug inside-coils of both 'buckers; position four is the most Fender-like selection. Typically, there's a small treble bleed cap on the volume control, so volume reduction retains clarity and dials in some subtle voice shaping; likewise, the tone control is beautifully graduated and handy to roll off that high-end detail if required. The most classic voicing of the Custom yet? We think so. Certainly, the 30th performs in all manner of musical styles, stopping short perhaps of ultra-high gain, although classic rock and earlier metal tones are easily achieved with a clarity that's not over-sharp but clear and defined. And, yes, if you know of another guitar that stays in tune this well and is so perfectly intonated all over the neck, then let us know. The smallest detail is considered, such as the feel of those control knobs and the perfect placement of the volume control, making subtle changes second nature. Guitars mean very different things to different people. 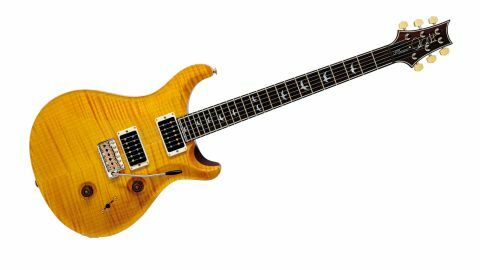 For some, owning a PRS is more a statement of status, for others they are just impossibly pretty things. Then there are the quality obsessives... on it goes. But the thing about this Custom is just how fit for purpose it is. From the effortless playability through to the intonation, tuning stability and hugely versatile sounds for a really wide range of styles, it never lets you down. And to our ears this is the most classic-sounding Custom to date: underneath the oh-so-pretty appearance is simply, if you can afford it, one of the best working tools that money can buy.